Enlisting the services of Waterproofing Professionals comes with the explanation and development of strategies to fulfill your needs. In any form of Waterproofing Strategy, most Waterproofing Experts will attain the information on four major functions: Leak History in the building or area, Identify Location of the Leak, Rule out the possibility of Ambient Moisture and then Determine a Leak Solution. Weather is unpredictable. Buildings should be equipped to handle the different forms of weather that can happen, but sometimes are unable to do so. Fluctuations in the temperature cause incredible strain on building materials making them susceptible to leaks. Rainwater serves as the independent variable in attaining the cause of the leak. If rainwater runoff causes the leak, then the structure has been compromised. If the issue occurs without the presence of rainwater, then most likely it’s a plumbing issue. Following a review of the leak history, test are required to identify the type of leak. A positive chlorine test will determine if the water is drinking water and thus a piping issue. A positive coliform count test will determine if the water is sewage. If the water tests negative to both tests then its a positive assumption the issue was caused by rainwater. Expect these test to happen before waterproofing takes place. Although, these test can provide concrete results, Waterproofing Experts must rule out the possibility of ambient moisture in the initial construction of the building. Moisture could have been trapped within the walls and so the dampness or moisture that’s visible may not necessarily come from a leak. Water flows, therefore, the initial site of the leak or dampness may not present the actual site of the water. A full investigation will occur in order to find the site. Experts will check construction specification and drawing to see if any side of the building was compromised. A flood test might also be necessary. In such an occurrence, Experts will use dyes and additives to track the flow of water providing a visible trail to the source. Once the leak has been found, Waterproofing Experts have access to a selection of solutions: Positive and Negative-Side Waterproofing, Blind-side waterproofing or damp-proofing. In this instance, Experts will waterproof the area directly in contact with water, creating a barrier preventing water from entering the building. A great example would be waterproofing/sealing of roofs, as the roof is in direct contact with water. 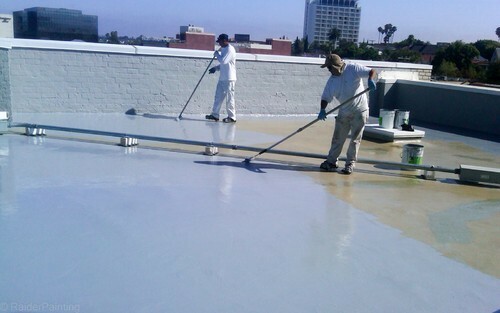 Positive Side is the most popular form of waterproofing, due to its simplicity and cost-effectiveness. Unfortunately, with this process, if another leak occurs it becomes harder to find its location and require excavation. Blind-side Waterproofing is essentially the same process as Positive side, however, concrete is poured over the waterproofing, bonding and strengthening the seal. Again, if compromised, the building requires excavation in order to identify the problem. If positive-side waterproofing relates to the side with direct contact to water then negative-side is the opposite. In this process, the area on the other side of the concrete or rather the inside is waterproofed. Effectively, Negative-Side Waterproofing is insolation, but instead of maintaining temperature, you are maintaining dryness. The waterproofing solution is pumped directly into walls filling it up from the inside. While Negative-Side Waterproofing allows for easier detection, moisture can develop inside. As specified earlier, the waterproofing solution is pumped directly into the wall piercing the wall, allowing for water particles in the air to enter and get trapped inside. It is also important to note that damp-proofing and waterproofing is not the same thing. Damp-proofing is a rather limited process and cheaper for it is not flexible to weather changes. Building materials react differently depending on the weather. Damp-proofing does not bridge gaps/cracks in the wall nor does it stretch or shrink.